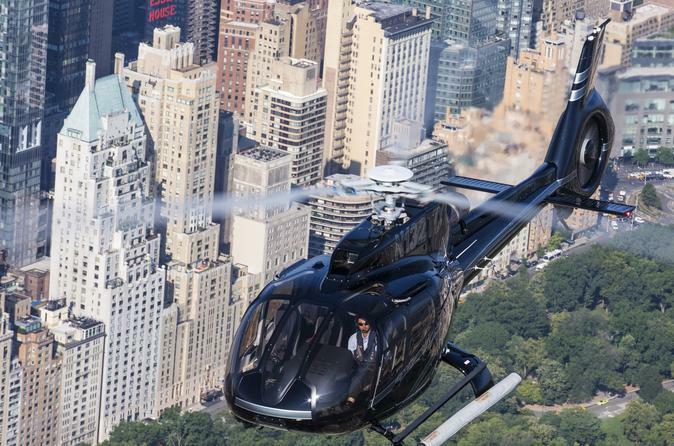 See New York City from all angles in your own private helicopter! Choose from an afternoon or night flight and see New York City from a fantastic aerial perspective. From Penn Station New York hop aboard a New Jersey transit train to the Linden NJ Train Station (Round trip adult ticket is $17). A shuttle service will be available from the station to Linden Municipal Airport. Your journey begins by flying directly over Newark International Airport towards Manhattan. En route to New York Harbor you will view the illuminated Statue of Liberty before viewing the skyscrapers of the Financial District, home of The New York Stock Exchange. Flying north along the Hudson River, guests will catch a glimpse of the Empire State Building, as well as Madison Square Garden, Hudson Yards, Chelsea, The West Village, SOHO and TRIBECA. 9/11 Memorial and One World Trade Center are also in view. Be prepared to get some great pictures as you cross over Central Park, flying directly over New York City. From Central Park you can see the Rockefeller Center and the bright lights of Times Square! After passing over the Metropolitan Museum of Art the helicopter will turn around just north of Roosevelt Island returning along the same path, offering all passengers spectacular views of the Manhattan skyline. The flight is approximately 25-30 minutes in duration.